There are some items that are grabbed enthusiastically from The Progressive Aspect ‘in box’ and there are some things that hang around waiting to be considered, and hopefully loved. Strangely, despite the long delay in reviewing, this epic release from Neal Morse was actually picked up initially with enthusiasm by another TPA colleague, but then ‘real life’ got in the way. This helps explain why TPA are just getting around to reviewing the Morsefest 2014 when Morsefest 2016 is about to commence! I eventually volunteered to take it on, and when the 4 CD/2 DVD package thumped loudly on my doormat I sort of understood why my colleague had not quite managed to put pen to paper or fingers to keyboard. 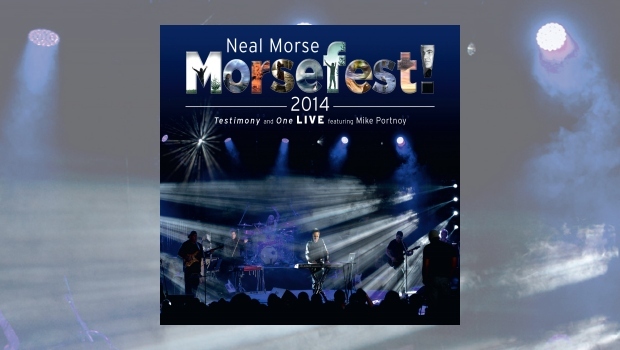 This is a MAMMOTH release encompassing live performances of the Neal Morse albums Testimony and One with extras, all played out in front of an adoring fan convention crowd. For something of this scale there is no point in going through it track by track – we would all lose the will to live! Suffice it to say that Neal Morse and his band perform powerful versions of these albums, appropriately filled with spirit and feeling. 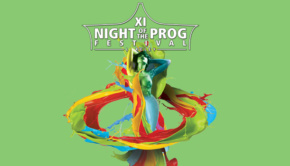 This is more than just a concert or a fan convention – this is a document of a Prog Rock religious event full of Christian fervour and testimony. Yes, I said the ‘C’ word… I know some people object to Morse’s tendency to infuse his albums now with an unashamedly overt Christian message. He was always a spiritual soul with songs like Stranger in your Soul from Transatlantic’s Bridge Across Forever clearly indicating a spiritual awakening, albeit in less obviously Christian worded lyrics. Morsefest 2014 is floridly and joyously Christian – it’s the Prog Rock version of one of those enthusiastic evangelical shows in circus tents that used to cross America, and may still do for all I know! 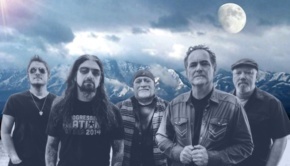 Neal Morse is the ‘Prog Preacher’, pounding out his personal heart felt message passionately. This may alarm some listeners, but complaining about the fact that the subject of Christianity may be on a Neal Morse release is like going into an Indian restaurant and complaining that the food is rather too spicy for your liking! Morse interweaves the music with his own personal story of conversion to his new faith… or was it a re-awakening? Even legendary drummer Mike Portnoy spends part of the show testifying about his friendship with Neal Morse. Morse’s repeated and sincere proclamations about his life journey and his faith is something that may appeal to American fans from the evangelical Christian sects, but may be something that some less ardently faithful may find a little awkward or uncomfortable. What is without doubt is the strength of feeling and sincerity that pours out of Morse, especially when talking and singing about his daughter, Jayda’s apparently miraculous cure from a serious medical condition. What is also without doubt that Morse is one of the ultimate Showmen in modern Prog rock. 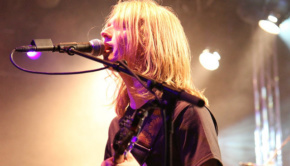 He is backed by an awesome band of consummate musicians, particularly the stellar guitar work of Eric Gillette. Randy George keeps the whole show tied down securely with his rock solid bass whilst Portnoy’s incendiary drumming drives on this Prog Rock behemoth. The addition of a brass section and the skills of Eric Brenton on violin, mandolin and flute give the experience some variety and some unexpectedly West End stage show and folky moments. The presence of a sizeable backing vocal section evokes a sense of a massed choir, adding to the praise and worship in the venue of Morse’s own home Nashville, Tennessee church. Of course, despite Morse’s modesty throughout the show he is the undoubted star of the piece with top quality singing, his usual keyboard skills and delicate guitar playing. He really is infectious in his friendly and enthusiastic manner, and it’s hard not to be won over by his musicianship. After telling his own personal story and performing joy filled renditions of Testimony and One, Morse introduces his brother Alan Morse and to the delight of the crowd they launch into a muscular version of the Spock’s Beard classic The Light. If that’s not enough they then finish with a rousing version of the aforementioned Stranger in Your Soul by Transatlantic. It’s hard to believe that even the most hard bitten cynic who may have strayed into that venue on those nights at Morsefest 2014 would not have been swept along by the musical and spiritual tide that was flooding that church by the end, and may have been ‘happy clappy’ with the rest of the congregation (for this is more than an audience) with arms aloft in worship… only of Morse the Prog Rock star maybe… but who knows what this may have stirred for some that night? However, that last point regarding the power of these performances may also be a weakness in this release. It’s difficult to imagine many casual fans delving deeply into such an enormous fan based convention release. 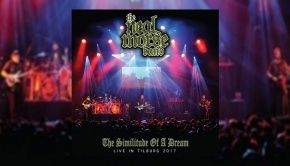 It’s certainly aimed squarely at full-on Neal Morse fans and is undoubtedly an excellent document of that event. More general Prog Rock fans may find the sheer volume of this product and the ‘C’ word mentioned above a little difficult to expose themselves to in their listening, which may be rather a pity in some ways as the live music on this release is excellent. On the other hand – it really, really helps if you had been there!